With HIAB’s Crane Tip Control, 3 levers do it all. Posted on November 29, 2016 November 29, 2016 , in HIAB Crane. Safe, accurate crane operation requires a lot of skill and expertise on the part of the operator. And skilled operators are in high demand and many spend years perfecting their techniques. But even then, loading, unloading and delivering a load with pinpoint accuracy in tricky conditions isn’t easy. Crane operators have to be constantly aware and in control of multiple slewing, booms and vertical movements – until now. 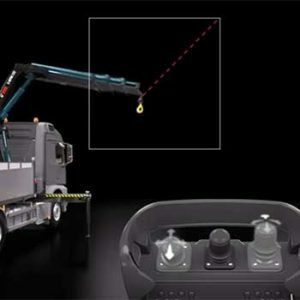 Ever known for innovations that make things safer and easier for operators, HIAB has introduced a new software feature to their HiPro control system: Crane Tip Control (CTC). One touch of a button on the hand controller seamlessly gets you there. CTC controls the tip instead of each crane function. Like the name implies, it’s designed to give the operator better control of the tip of the crane –But that would be an understatement. Operators can now move their load to a particular point in space, and CTC will automatically determine the best way to get it there with absolute precision. You only have to focus on the crane’s motion. And with CTC, HIAB has simplified tasks that used to require the operator to simultaneously control complex multiple movements down to three levers – one for horizontal movements, one for vertical lift and one to fold and unfold. One lever in each hand provides a full, accurate 45-degree lift. And the crane tip travels a perfect vertical path without any need for a hoist. You just focus on moving your load from here – to there. This kind of innovation from HIAB is a game changer. Why? It’s so safe, simple and accurate that handling a big crane has never been easier. Or more cost effective. It allows new operators to manipulate their cranes like pros in no time, so there’s way less training required. You can take on more advanced projects too because less skill is required to do them. And it’s so much faster and safer too. When you speed up crane motion – and remove human error – you’re saving time every lift, every job, everyday. That adds up to greater productivity and bigger profits.